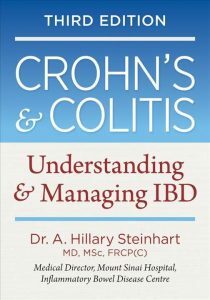 Crohn’s and Colitis: Understanding and Managing IBD is written by Dr. A. Hillary Steinhart, a Professor of Medicine in the Department of Medicine at the University of Toronto. Steinhart is also the Head of the Combined Division of Gastroenterology at Mount Sinai Hospital and University Health Network in Toronto. Within the book it includes information about the bowel diseases and effective ways to manage it. The book includes numerous about of informational charts; some of the charts included were Lactose Ladder, Alternative Food Sources of Calcium, and Eating Well with Canada’s Food Guide. Not only does the chart help to the reader with the information given, but the element of the Question and Answer place around the passage along with definitions give the reader a better understanding. This is a great book to read and a great way to get informed about Crohn’s and Colitis disease.